Tendonitis in the foot is a common problem because we use our feet continuously. It is a common example of an overuse injury. One of the most frequently affected tendons is the posterior tibial tendon, a structure that is normally hard at work, helping to hold the arch up and prevent over-pronation or rolling in of the foot. This is a major cause of adult flat foot. The posterior tibial tendon (below) runs behind the inside bump on the ankle (the medial malleolus), across the instep, and attaches to the bottom of the foot. 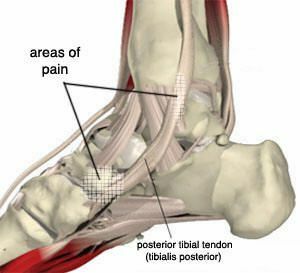 The symptoms of tendonitis of the posterior tibial tendon include pain (below) in the instep area of the foot and swelling along the course of the tendon. The patient may also experience pain and swelling right behind the inner ankle bone. There is pain upon palpation along the course of the posterior tibial tendon behind the inner ankle. There may also be burning, shooting, tingling, stabbing pain , because the nerve is inflamed inside the tarsal tunnel. Patients experience significant pain when walking, steadily worsening toward the end of the day. There is significant pain when the patient inverts his/her foot, as well as pain upon passive stretching of the posterior tibial tendon, and on eversion or flattening of the foot. In some cases the tendon may actually rupture or tear, due to weakening of the tendon by the inflammatory process. Rupture of the tendon leads to a fairly pronounced flatfoot deformity that is easily recognizable.